Although it may sound like heresy, Google isn’t the only game in town. Despite Google’s large index and generally excellent results, it doesn’t even come close to indexing every page on the Web, and other search engines catch pages Google doesn’t. In addition, because each engine has its own algorithms for determining the order in which matches appear, you may find that you get more-useful results on some topics with another tool, such as Yahoo, Ask.com, Cuil, or the venerable AltaVista. One reason more Mac users don’t use these alternative search engines is that Safari’s built-in search feature is hard-wired to use only Google. Google is also the default search engine in other popular browsers, such as Firefox and The Omni Group’s $15 OmniWeb ( ). But don’t let that stop you. If you want the convenience of searching from your browser’s toolbar and the flexibility of using another search engine, you have some options. If you’d like to stick with Safari, many third-party plug-ins let you add other search engines to the browser’s toolbar—and most include other helpful features as well. David Watanabe’s free Inquisitor adds predictive searching to Safari’s search field: as you type, it guesses which search terms you want to use, much as Google does. It also lets you quickly choose from various country-specific versions of Google and Yahoo, and you can use it to add search engines that aren’t in the plug-in’s standard list to Safari’s search bar. 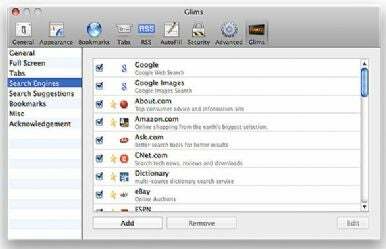 If you like the convenience of Safari's toolbar search field, but want to use something other than Google to search the Web, try a plug-in like Glims. Using its preferences, you can select any of numerous built-in search engines or add your own to the list. MacHangout.com’s free Glims offers predictive searching and lets you change or add search engines. It also adds a long list of other features to Safari. Hao Li’s $12 Saft ( ) lets you type an abbreviation for a search engine (use one that’s included or add your own), followed by your search terms, into Safari’s address bar—so you can bypass the normal search field altogether. For example, you can type osxh safari to search Mac OS X Hints for tips on using Safari. Most other Web browsers make it very easy to use whichever search engine you want—no add-ons required. In Firefox, choose a different one by selecting it from the pop-up menu to the left of the search field; if you want one not listed there, select Manage Search Engines to add your own. Similarly, OmniWeb, Mozilla’s Camino ( ), Flock ( ), Alexander Clauss’s iCab ( ), and Opera Software’s Opera ( ) let you choose from several built-in search engine options or add your own. Mozilla’s SeaMonkey ( ) is the most limited. It lets you choose Google, Ask.com, or dmoz.org and doesn’t let you add your own. Since every search engine provides different results, you may have to check a few before you get the results you need. Why not save yourself a couple of steps and search multiple search engines at once? Use a Multiple-Engine Search Site The easy way to do this is to visit a multiple-engine search site in your browser. For example, Dogpile compiles results from Google, Yahoo, Microsoft Live Search, and Ask.com, while PolyCola.com provides side-by-side results from any two of seven engines, including Dogpile itself. Get a Serious Search Tool If you’re doing extensive research, consider a high-powered tool such as Devon Technologies’ $50 DevonAgent ( ). In addition to being a stand-alone Web browser, it’s a full-featured research tool. DevonAgent lets you create complex searches that include Boolean operators, proximity terms, and filtering—spanning not just a few search engines but as many as you like. DevonAgent can run complex Web searches and then analyze the data for you. For example, select one of your keywords in DevonAgent's results window to see a network diagram showing how that term interrelates with other common terms that appeared in the search results. DevonAgent downloads and analyzes all pages that match your query and then presents you with a summary of just the results you’re looking for. 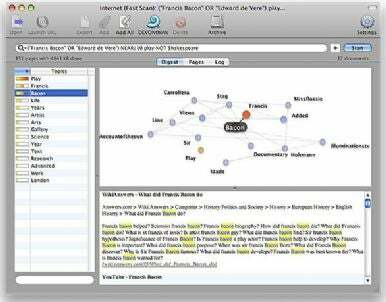 For example, you could have the program comb dozens of search engines for PDF files in which either Francis Bacon or Edward de Vere appear within ten words of the term play but where the name Shakespeare is not mentioned (see “Beyond Basic Searches”). Although these elaborate searches may take hours rather than seconds, they can turn up results that are far more specific, and more useful, than typical Web searches.